On Thursday 8 January 2004, the largest, longest, tallest, widest and most expensive ocean liner was named Queen Mary 2 at an historic ceremony that took place in Southampton (England). 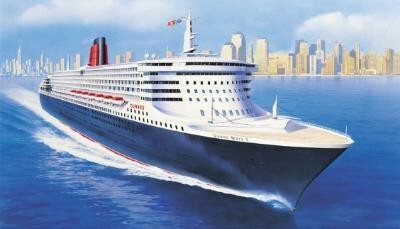 This is the Cunard project. The ship was built by Chantiers de l'Atlantique, a subsidiary of the large French company Alstom. The ship has 345m (1131 feet )length, 72 meters ( 236.2 feet ) height, 150,000 tons registered tonnage , 2800 berths ,30 knots speed.